If you’ve ever watched a modern-day shonen sports anime, you probably noticed that most of them tend to follow a formula: a talented but imperfect first-year joins a sports club that has fallen from grace, and the rest of the series follows them as they push toward the big leagues. The team goes through some setbacks and rivalries, but they finally reach the top, carrying the dreams of their upperclassman and making victory a reality. Yowamushi Pedal, centered around cheerful but secretly talented first-year Onoda Sakamichi, is no exception to this rule. With encouragement from his team and new friends, Onoda propels Sohoku to victory, while their rivals, the perennial champions, Hakone Gakuen, are left behind. Normally, you would expect the series to end there, but this story steps in a different direction and continues into Onoda’s second year. This is unfamiliar territory for most shonen sports series. So much changes in one year, with upperclassmen graduating, new captains, and fresh first years trying to join the club. But the thing that perhaps weighs most heavily is this: what happens to hope when the underdogs are no longer officially the underdogs? Sohoku enters their second year in a blaze of glory. As the defending champions, they’re required to be stronger than ever to keep their title and prove that last year’s victory wasn’t a fluke. This is a heavy burden, one that they have trouble grappling with. The powerhouses of the team have graduated, and with a new captain, things don’t look so easy. They may hold the title, but they’re still struggling. The most prominent example comes in the form of Teshima Junta, Sohoku’s new captain, replacing the stalwart Kinjou as the team’s guiding force. He wasn’t able to make it onto the final team last year, but now he’s the one poised to lead them all. The problem is, Teshima’s most distinctive feature is that he is relatively unremarkable. 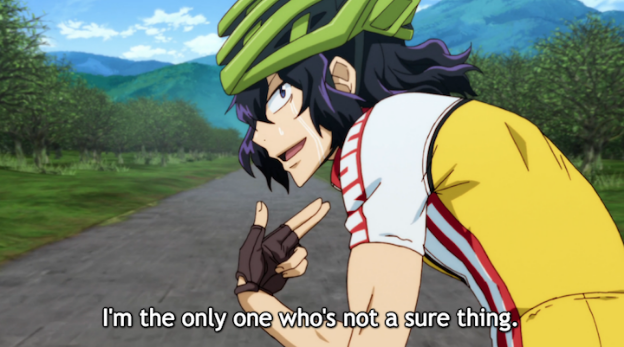 Unlike many sports anime characters who have a hidden talent, Teshima is noted repeatedly to be ordinary. He works hard, but he’s no genius, and doesn’t have the kind of traditional charisma that most leaders flaunt. As a result, there’s a lot of doubt – even from within his own team – that he’s fit to lead, or even have a position on the team at all. Early on in the previous season, he was challenged by his teammate Koga for captaincy under these pretenses: someone without capability should not be in a position of power. Teshima not only has to carry his team to another victory, but also has to prove himself to the world. 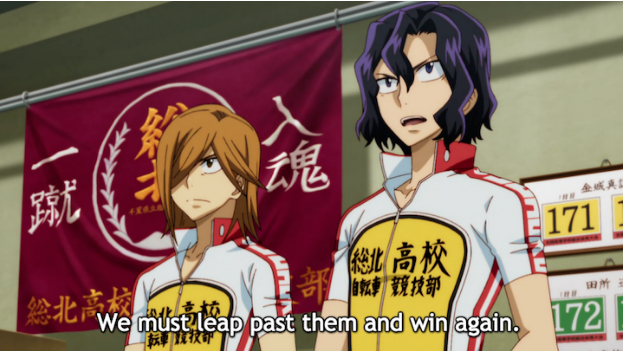 Even if Teshima is in charge of leading the champions, he’s by no means in a position of power. Still, responsibility dictates that he keeps moving forward in the face of all challenges, and he takes them in stride. While everyone’s doubts are warranted, Teshima doesn’t let up on his hard work. This ends up propelling him to not only command the team, but also face off against one of Hakone’s strongest members for the mountain checkpoint. 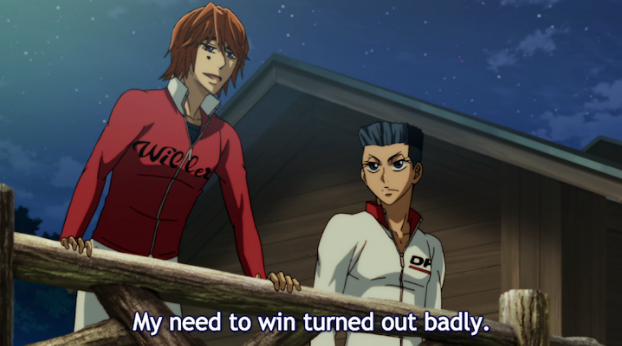 Sohoku may be the new champions, but, as evidenced by Teshima’s struggle, they still have plenty to reach toward. Hakone is a team so used to victory that it’s ingrained in them. That image has been synonymous with them for so long that losing the Interhigh was a huge blow to their pride and self-image. They can’t be the Kings if they’ve experienced a loss. With four of the six original members of the team graduating, Hakone feels a distinct gap as they fill their ranks. They are by no means weak after their defeat, but they’ve suffered a strong blow to their pride. A team normally so proud in their strength has come to taste what’s happening on the other side. One of the new members of Hakone is Ashikiba Takuto, who was introduced at the start of New Generation. While he’s a third year, this is his first time on the team in an official capacity. The previous upperclassmen encouraged him to ride, but when it came chance to prove himself, Ashikiba messed up. During a preliminary race, his nerves got the better of him and combined with the pressure to win, he panicked. As a result, he was banned from the team and was unable to participate in the previous year’s Interhigh. He cites this as a major fault of his, even going so far as to call it a sin for disgracing the name of the team he so admires. Still, he bonds with his new team, and gains enough confidence to aim to be the team’s next ace. For Ashikiba, his problems still weigh heavily on him, but his willingness to put his all into the team he cares for nudges him forward. Sure enough, it’s enough to land him on the victory podium for the first day. He’s not cycling backwards anymore. The older members are not alone in trying to forge paths out of their past; the newest first years also come with their own pasts and problems. Glory Line starts out by highlighting the first-years from each team: Kaburagi Issa from Sohoku, Shinkai Yuuto from Hakone, and Kishigami Komari from Kyoto Fushimi. Kaburagi begins the season by rapidly falling behind due to a bad case of nerves, nearly resulting in him dropping out of the Interhigh. Komari's reluctance to acknowledge boundaries is revealed to be a consequence of having to closet himself for most of his life. Yuuto's frustration and desire to prove himself stems from being constantly overshadowed by his older brother Hayato. These three start out the season with a lot of baggage, and flail under the weight of it. Luckily for them, however, these setbacks do not bring their journeys to a premature end. Kaburagi receives help from Koga on the road and, later on, from his teammate and upperclassman Aoyagi Hajime, who purposely falls behind to retrieve him. 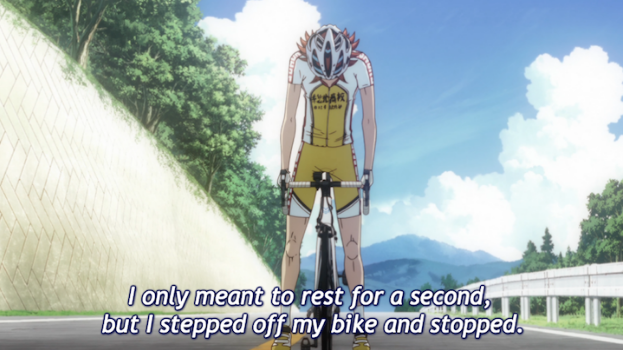 Being able to receive a second chance allows Kaburagi to shine and despite some embarrassments, he's able to work with Aoyagi to slowly climb back to the main team. Komari comes from a traditional family, and has always been interested in people's' bodies. He's acutely aware of how uncomfortable this is, and keeps his wants hidden until he’s urged to let them free. In challenging Izumida Touichirou, someone who is very proud of his body and is also looked upon as strange for appreciating his own form, Komari is forced to communicate with someone that can understand how he feels. As the younger Shinkai, Yuuto is constantly walking in Hayato's legacy. 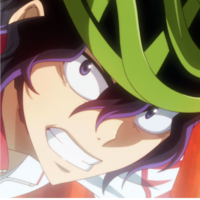 His desire to prove himself by challenging someone as prominent as Onoda is a fight to make his own name. While it's still early on in the series, how Yuuto will manage to overcome this is very likely to come up somewhere down the road. These three characters take up the mantle this season, and set the course for the rest of the season ahead. Yowamushi Pedal is particularly inspiring in its range of issues the characters must face, and the amount of sincerity it puts into showing that these issues are legitimate. Every character has their own motivations and frustrations, and to race is to pit these against each other. Despite the personal victories of individual characters, these struggles aren't undermined. Losing in a race doesn't delegitimize the struggles the character went through, nor does it rank one as superior to the other. Instead, the characters are able to take something from their loss and add it to their motivations. Rather than putting victory as the absolute, everyone is encouraged to grow not only as cyclists, but also as people. Losses aren’t the end-all-be-all, they’re simply a hurdle on the path to growth. What’s on that path isn’t just misery, but also a search to attain hope and keep it alive. With the rest of Glory Line ahead of us, it will surely be a delight to see how the cast tackles their new challenges, and how they can further step out of the shadows of their mistakes.